We’d love your help. Let us know what’s wrong with this preview of 5 Editors Tackle the 12 Fatal Flaws of Fiction Writing by C.S. Lakin. And the biggest challenge comes from the inability to see what isn’t working. The prose feels off. The scene isn’t gelling. The dialogue sounds stilted or clunky. But they don’t know why or how to fix it. 5 Editors Tackle the Twelve Fatal Flaws of Fiction Writing demonstrates the deadly dozen pitfalls on the road to a strong story, along with revisions that show writers exactly how to avoid novel failure. No other writing craft book offers such detailed instruction in how to spot and remedy the major flaws of fiction writing. What makes this book an important addition to a writer’s bookshelf? More than 60 Before and After passages showcase each of the twelve fatal flaws, which are then picked apart and examined to help writers spot these flaws in their own writing and fix them. Five editors with extensive background in both editing fiction and writing novels bring a wealth of insights, examples, and solutions to these flaws, using various genre styles and POVs. Each chapter ends with a checklist to help writers seek and destroy these fatal flaws in their manuscript, followed by bonus Before and After passages to help them test what they’ve learned. This in-depth guide to self-editing is an invaluable resource for any writer of any genre. It shows, not just tells, how to write better fiction. Using it, you’ll be armed with the tools and skills you need to conquer the twelve fatal flaws of fiction writing. To ask other readers questions about 5 Editors Tackle the 12 Fatal Flaws of Fiction Writing, please sign up. This is the first book on the writing craft I’ve finished in a while. I’ve started a lot but stopped reading because they felt so basic. Often they all have the same information, and it just doesn’t feel like it is worth my time. This book was amazing! Not only did it tackle some different information, but the whole set up made it very useful. These editors worked together to tackle the fatal flaws from different perspectives. Not only did they write about it, but they also wrote part of a story and then corrected it so you could see what they were talking about. Except for one author, who used a couple of curse words in one example and briefly described the reactions to a girl in a skimpy dress, the examples were clean. Even the one author’s examples didn’t go overboard, but I thought I would mention them for the sake of some of the people that read these reviews. I found it very helpful to read this right before I start editing my next book. I feel it will help me sharpen my focus and be able to see some of the flaws that I can so easily miss. I love the checklists at the end of each chapter so that you have a quick way of reviewing what you learned. I highly recommend this book for authors looking to improve their writing. I received an advance copy of 5 Editors Tackle the 12 Fatal Flaws of Fiction Writing in exchange for this honest review. As an editor, I value opportunities for continuing education and refresher courses. So I jumped at the chance to review this book written by five of my respected colleagues. Together they explore twelve areas authors commonly find difficult to master. Taking one “fatal flaw” at a time, these editors take turns discussing ways to identify these issues and ways to fix them. Each I received an advance copy of 5 Editors Tackle the 12 Fatal Flaws of Fiction Writing in exchange for this honest review. As an editor, I value opportunities for continuing education and refresher courses. So I jumped at the chance to review this book written by five of my respected colleagues. Together they explore twelve areas authors commonly find difficult to master. Taking one “fatal flaw” at a time, these editors take turns discussing ways to identify these issues and ways to fix them. Each editor has her own section within each chapter and gives her professional perspective on the problem at hand. Every section contains an example of a before passage with problems and an after passage that has been fixed. Having the five different perspectives also shows how different techniques can be used to accomplish different purposes. And at the end of each chapter, there is a sample passage for the readers to practice on. This allows the readers to apply what they’ve learned in each chapter. The advice is sound and there is a great advantage to receiving all five perspectives on each flaw. I certainly recognized these flaws as common errors I encounter in my editing and much of the advice is advice I give to my clients. I did learn a few new tricks, though, that I’ll be happily passing along to my authors. I gave this book four stars instead of five only because the format was not particularly my favorite. I would have preferred the five perspectives to be woven together seamlessly so the advice was offered in cohesive chapters instead of broken into sections. While this format will work very well for some readers and not as well for others, the content is valuable and practical and can be used by all. If you’ve had trouble with any of these twelve fatal flaws, you’ll surely appreciate owning a copy of this book! A wise person once observed that advice books on writing can be legitimately compared to tools sold to fossickers during the gold rush days of the 1800’s. History shows the only individuals who reliably prospered during such manic periods of ‘gold fever’ (“There’s bound to be some in them thar hills!”) were the business–minded types who set up shop supplying the requisite tools of trade – pans, picks, spades, gloves etc – to the ever hopeful prospectors; ninety-five percent of who would never se A wise person once observed that advice books on writing can be legitimately compared to tools sold to fossickers during the gold rush days of the 1800’s. History shows the only individuals who reliably prospered during such manic periods of ‘gold fever’ (“There’s bound to be some in them thar hills!”) were the business–minded types who set up shop supplying the requisite tools of trade – pans, picks, spades, gloves etc – to the ever hopeful prospectors; ninety-five percent of who would never see so much as an atom of the shiny stuff. And so it can be said with craft books when an everyday person with an interest in writing buys one offering to make them a more successful writer if only the advice is followed. When success and riches don’t follow in the promised quantities and the hard realities of competing in a sodden, hyper-saturated market begin to bite, where, if any, does the fault lie? Writing advice books, unlike say cookbooks, should be bought with a significantly lowered expectation that if the recipe is followed to the letter for, to take as an example, Pommes de Terre Duchesse (French potato meringues), the dish will emerge from the oven looking exactly as it appears in the celebrity chef endorsed, glossy how-to manual. By the same token, success due in part to reading writing advice books cannot be ruled out. John Grisham, James Patterson, Patricia Cornwall, Stephen King and any other flaming star in the writing world have no doubt, at some point in their lives read a craft book which in some way may have strengthened their style and ability. Writing advice books will always be written and bought. Accepting this reality, discussion of them therefore need focus on sorting the precious gems and vein deposits from the ever flowing river silt. Which brings us to FIVE EDITORS TACKLE THE TWELVE FATAL FLAWS OF FICTION. As writing advice books go, this one comes out above average without ever really threatening to rise to the stone cold classic mantle. Five female writers, all published authors and all connected to the online website LIVE WRITE THRIVE don the shiny sheriff’s badge of Editor and let rip with enough scholarly advice to sink a battleship. Let’s acknowledge straight up when talk turns to ‘rules of writing’ some readers will instinctively want to be rule breakers. Better then to think of ‘guidelines’ of which there are in spades in this text. The most skilled creators of these types of books know that readers don’t just come looking for information and motivation, they want understanding as well. So what does the amateur author looking to better themselves get for their money with this manual? Seems that everyone’s mother was right after all. The mantra of this book can be summed up in the age old advice about balance in all things, where balance means not too much and not too little. Balance between thought, action and emotion. Balance between narrative and dialogue. Balance between slowing down and cutting to the chase. Balance between adding vivid detail and deleting detail that is irrelevant. To their credit, the authors all acknowledge that a great many tips are more easily given then followed. This is welcome understanding for the reader. In another section the authors again eat humble pie and admit that ‘theory’ comes with its own in-built limitations and sometimes editorial advice can go askew. Apart from the twelve chapters devoted to making it clear what the classic flaws of fiction are perceived to be, the text also comes with before and after passages whereby the reader can bear witness firsthand to the transformational effect of the advice if followed. The before passages are generally both transparently and exaggeratedly ‘bad’ so the difference when they magically transform into ‘good’ writing after the application of the proffered advice is all the more noticeable. (“Granted, the before passage possibly seems extreme.” P117) As if to confirm this, one of the editors, Robin Patchen, confesses the ‘before’ passage took her five minutes to write while the ‘after’ passage took closer to an hour. Conclusion? It would appear bad writing flows so much more readily and comes that much more naturally to us all. The authors all quote extensively from their own published novels (“Let’s take a look at this scene from my novel _______________.”) This approach had to have saved a lot of time in chasing down copyright permissions to use other writer’s works, however there’s no denying this practice also carries with it the unfortunate air of self-promotion. Included as well are exercises where the reader is asked to put into practice the advice given and transform a passage of text themselves. The book naturally warns of the perils of purple prose and keeping to its ‘all things in moderation’ edict includes seemingly contradictory chapters on “Overwriting” and “Avoiding the Vague Swamp”, “Too Much Backstory” and “Too Little Backstory” as well as the obligatory chapter (Fatal Flaw # 6) on Showing Not Telling. Perhaps to avoid the complete slide into cliché the book also includes a chapter entitled “When it’s Better To tell Than Show”. Practical advice is positively swirling amongst these pages and while it does pack some serious fire power in this regard I couldn’t help but think that the large concrete slabs of, what at a certain point, begins to feel like unrelenting advice and correction, could perhaps have been made to feel a little more aerated with the addition of something of the order of a sprinkling, let’s say of writerly cartoons for example (You know the type where one person is saying to another less then serious stuff like –“My best fiction writing is my daily to-do list.”). If you’re looking to remain on the writing advice treadmill but want a little more entertainment along the way I recommend two other texts- HOW TO WRITE BADLY WELL by Joel Stickly and BACK TO CREATIVE WRTING SCHOOL by Bridget Whelan. This book is a quick read!! I would have finished it a lot sooner if I didn't have a lot going on. But to get right into this review I can say if you're a fiction writer, than this book is for you! It will help you out with learning right tricks to help with editing and not only that but help with learning to use words wisely. I received this book in exchange for an honest review. I really enjoyed reading this book. I found it very informative and painfully (at times) enlightening. I've read book that were guilty of some of these flaws and thought to myself: "Get on with it already." I found this book extremely useful for strengthening my own writing process. As well as helping with the editing process. If you are an author, I highly recommend you pick up a copy of this book today and try not to take it personally when I received this book in exchange for an honest review. I really enjoyed reading this book. I found it very informative and painfully (at times) enlightening. I've read book that were guilty of some of these flaws and thought to myself: "Get on with it already." I found this book extremely useful for strengthening my own writing process. As well as helping with the editing process. If you are an author, I highly recommend you pick up a copy of this book today and try not to take it personally when/if you seem to be guilty of every flaw or some of them. Just grin and bear it and work through it. Your writing will be stronger for it in the long run! So often, I think writers have too many editing books on their shelves. Editing is so subjective, and the ideas and methods of various books are as diverse as their editor-authors. But that's exactly WHY this book is one of the few that should be on your shelf. For every flaw addressed, you get the suggestions of at least three editors. Five offer their hard-won wisdom throughout the book, and I have no doubt you'll find tricks and ideas that work for you. It's so easy as a reader to see what wor So often, I think writers have too many editing books on their shelves. Editing is so subjective, and the ideas and methods of various books are as diverse as their editor-authors. But that's exactly WHY this book is one of the few that should be on your shelf. This book has already transformed my writing more than any other book I've read----more than any class I've taken. Showing the examples of when it's done wrong and when it's done right, was exactly what I needed. I have struggled for years to understand why my writing stays very much on the page----no leaping off it whatsoever. Practicing the techniques in this book was not only fun, it has completely changed the way I approach my writing! I am definitely going to read ever AMAZING! PHENOMENAL! Great book on the craft of writing fiction. It's a unique look behind the scenes, into an editor's head--five editors! It gives clear examples to help you understand what it means to head hop, info dump, feed the reader information, etc. I recommend this book to all my writer friends and clients. This book is packed with great info. Several editors weigh in on each subject all with different useful but not conflicting ideas. Whatever your bad writing habits are, you will undoubtedly find help within these pages. A great insight about writing! A book full of practical advice, clearly explained with examples and exercises. This book really helped me understand how to improve my writing. This is taken from a blog, but it's well organized and informative. I really liked the format of one issue at a time, tackled by each of 5 editors. Experienced writers will find it less useful than beginning writers, but even for the experienced writer, there is probably good insight in some of the chapters. There are a lot of writing exercises, which I don't bother with, but I didn't find that a reason to lower my rating. I always want to learn more about some of the important tricks of the writing trade (especially now, before I get back behind my laptop to write my own stories), and I've been lucky enough to have received an Uncorrected Proof Copy of 5 Editors Tackle the 12 Fatal Flaws of Fiction Writing, part of The Writer’s Toolbox Series by C. S. Lakin, with Linda S. Clare, Christy Distler, Robin Patchen, and Rachel Starr Thomson. That this isn't just another book about How To Write, is made clear in the intr I always want to learn more about some of the important tricks of the writing trade (especially now, before I get back behind my laptop to write my own stories), and I've been lucky enough to have received an Uncorrected Proof Copy of 5 Editors Tackle the 12 Fatal Flaws of Fiction Writing, part of The Writer’s Toolbox Series by C. S. Lakin, with Linda S. Clare, Christy Distler, Robin Patchen, and Rachel Starr Thomson. That this isn't just another book about How To Write, is made clear in the introduction. Many guidebooks for new and aspiring writers often tell you what to do and what not to do. Often, in the 'to do' chapters you are offered bits of prose by best-selling authors that are a prime example of how it's done, or how a text works - but that type of information doesn't always click. You can see that it works, but seeing a polished, oft-edited and revised bit of prose doesn't necessarily teach you how to polish, edit and revise your own text into something a reader wants to read. Which is why the authors of this book have focused on providing examples of the most common manuscript mistakes, samples for the reader to work with, to get their hands dirty with. Taking twelve often-made 'fatal flaws' as the structure for the book, each editor provides a paragraph in which that flaw is prominently dissected, examined, displayed, edited and reexamined. The reader is meant to go through the passage and discover for himself what isn't working - based on what he's learnt the chapter so far - and see if he can not only spot the flaws, but also try and rewrite the passage to iron out the kinks. And of course, a passage rewritten by the editor is provided for the reader to compare notes. The '12 fatal flaws' are called that because each of them has the potential to weaken the narrative, or 'scare off' a reader, so to speak. Which explains why you can come across opposites such as overwriting and underwriting, both of which can bog down the story you're trying to get across. Most of these flaws are traps that budding (and experienced) writers easily fall into. Which isn't a bad thing - so long as you know what to look for when the time comes to revise and edit. And this book helps you do exactly that. The editors take structural topics such as point of view and backstory issues, but also go down to the more nitty gritty parts of writing a good, clear plot: sentence structure, to adverb or not to adverb, and the use of punctuation. Save the would-be author in your family a few headaches with this book from The Writer’s Toolbox Series, 5 Editors Tackle the 12 Fatal Flaws of Fiction Writing. Editors C. S. Lakin, Linda S. Clare, Christy Distler, Robin Patchen, and Rachel Starr Thomson collaborate on how to handle twelve problems in fiction writing. Each editor writes on one or more aspects of each of the twelve problems, giving readers what amounts to a panel discussion on the problem areas. With five editors writing on the sa Save the would-be author in your family a few headaches with this book from The Writer’s Toolbox Series, 5 Editors Tackle the 12 Fatal Flaws of Fiction Writing. Editors C. S. Lakin, Linda S. Clare, Christy Distler, Robin Patchen, and Rachel Starr Thomson collaborate on how to handle twelve problems in fiction writing. Each editor writes on one or more aspects of each of the twelve problems, giving readers what amounts to a panel discussion on the problem areas. With five editors writing on the same problem, do they repeat each other much? Maybe in the introductory comments, but they work together bring up different angles on the topic. Sentences can fail to communicate in many different ways. Dialogue flaws are multitudinous. A developing writer will likely find many spots to polish when applying this advice to their own writing. The editors also give five examples of bad writing on each problem as well as a summary example at the end of each chapter, making this book something of a writing workshop if you’re willing to rewrite each example and then compare your work to the suggestion provided. Each chapter concludes with a handy review page listing all of the advice for that problem and a practice example to work on. A book like this should save would-be writers plenty of emotional (and literal) cash when approaching an editor with their manuscript. As writers—as you surely must be if you’re considering buying this book—we are all undoubtedly avid readers. As readers, we instinctively know what works and what doesn’t. I’m sure you’ve all experienced moments of pure connection and immersion while reading your favorite novels; however achieving that same feeling in your own writing is never as easy as sensing what works (and omitting what doesn’t). That’s where 5 Editors Tackle the 12 Fatal Flaws of Fiction Writing comes in. As previous review As writers—as you surely must be if you’re considering buying this book—we are all undoubtedly avid readers. As readers, we instinctively know what works and what doesn’t. I’m sure you’ve all experienced moments of pure connection and immersion while reading your favorite novels; however achieving that same feeling in your own writing is never as easy as sensing what works (and omitting what doesn’t). That’s where 5 Editors Tackle the 12 Fatal Flaws of Fiction Writing comes in. As previous reviewers have mentioned, the book is beautifully laid out. Each of the twelve flaws is presented by multiple editors, and each offers samples of before (bad) and after (better). I found myself marking up the ‘before’ samples with red pen before turning to the ‘after’ samples to see how my choices for improvement compared with the changes each author made in their improved version. I find I learn better by doing than listening—or reading, in this case. I also appreciated the different ideas, and similar ideas presented differently, that the five author-editors brought to the mix. Since each of us have different versions of the fatal flaws, this book is like getting five self-help books in one. It’s definitely an investment in your own writing career, and I can’t wait for the companion workbook to be available! If any of you would like to purchase a package deal, I also highly recommend C.S. Lakin’s book, Shooting Your Novel. It’s my favorite self-help book ever; it really opened my eyes about what was lacking in certain scenes in my novel, and about why some worked and others didn’t. And I didn’t receive a free copy of that book in exchange for an honest review! 5 Editors Tackle the 12 Fatal Flaws of Fiction Writing is an essential addition to The Writer's Toolbox Series. This how-to-write book is different from the myriad other writing how-to books on the market in that these editors SHOW rather than just TELL. And then they SHOW why the mantra “Show. Don’t Tell” is not always the best advice.They reiterate that you need to know the rules in order to break the rules. This book caters to writers who love examples. ME! Each fatal flaw is contained in its o 5 Editors Tackle the 12 Fatal Flaws of Fiction Writing is an essential addition to The Writer's Toolbox Series. Each fatal flaw is contained in its own chapter. Each contributing editor instructs the reader in a non-condescending manner expanding upon the previous editor’s insight and instruction illustrating the chapter’s fatal flaw with personal samples from their own writing. They demonstrate how to strengthen scenes by fixing the fatal flaw in those segments. At the end of each chapter, the reader is provided a sample writing opportunity to practice applying what they learned. I especially love the chapter ending checklists. You’ll want to print them out and keep them handy as you write or edit. Look for the quotable nuggets of writing wisdom under the “In Conclusion” sections. As a writer working towards debuting my novel, this book is an exciting addition to my Writer's Toolbox. With five editors covering a vast array of holes that sink our fictional ships, it's a reference I look forward to returning to again and again as I edit my manuscript. I liked the variety of editors who wrote this book. Together they covered much more ground than one could alone, and I liked reading their different voices as they explained the flaws of fiction writing from each of their uniqu As a writer working towards debuting my novel, this book is an exciting addition to my Writer's Toolbox. With five editors covering a vast array of holes that sink our fictional ships, it's a reference I look forward to returning to again and again as I edit my manuscript. I liked the variety of editors who wrote this book. Together they covered much more ground than one could alone, and I liked reading their different voices as they explained the flaws of fiction writing from each of their unique perspectives. I also enjoyed the checklists at the end of each chapter and the opportunity to practice finding the flaws in samples they provide. These were great for applying the insights I learned before tackling my own work. The only thing that bugged me is that the samples used for their before and after sections seemed a bit rushed. They definitely did their job, but the essence of fiction that piques your interest and makes a point vivid was not present in the examples, which deflated the effect of having a poor "before" and beautifully polished "after." This, however, is more of a personal preference for me. The five editors cover 12 subjects and all 12 subjects are, I think, spot-on. Thematically, this book has real value. However, the individual editors are hit-or-miss; Lakin is probably the strongest of the whole. My only gripe is that all five editors seem to favor a specific style of writing that isn't necessarily the best style for beginning authors to emulate. The highly emotive blend of third-person narration with first-person mental asides pervades the examples. But this style isn't exactly the only one out there and some editors (including me!) rarely accept submissions presented with the structure and voice recommended by these authors. This was an incredibly helpful book. While I believe I have a solid grasp of what makes a good plot and overall story as a whole, I struggle more on the scene-by-scene or sentence-by-sentence level as a writer, and this book did a great job of meeting me where I was at and showing how to avoid different writing flaws. For a book written by five different authors, it flowed very smoothly, and the multiplicity of examples they used to illustrate their points was incredibly helpful. All-in-all, thi This was an incredibly helpful book. While I believe I have a solid grasp of what makes a good plot and overall story as a whole, I struggle more on the scene-by-scene or sentence-by-sentence level as a writer, and this book did a great job of meeting me where I was at and showing how to avoid different writing flaws. For a book written by five different authors, it flowed very smoothly, and the multiplicity of examples they used to illustrate their points was incredibly helpful. All-in-all, this was a very practical and useful book that I'll be keeping on-hand as a reference. An excellent addition to the growing collection of writing craft books that every author should own. 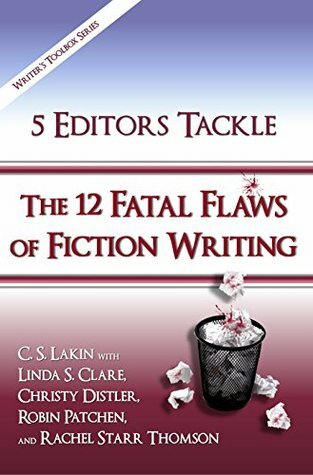 The five editors each tackle a different aspect of the 12 "fatal flaws" and provide excellent plain-spoken explanations and helpful before/after passages (many of the former are quite cringe-inducing). I'll be sure to reference each chapter's Fatal Flaw checklist as I revise each of my chapters. And recommend everyone else do the same. I'm an avid reader so I'm always interested in the craft of writing. The do's and don'ts of fiction writing is especially fascinating;I love the scenarios this book would give of a fatal flaw and then give you the correct way it should have been written. The best part was the scenarios given for you to correct on your own. If I enjoyed reading this as a reader then a writer would be like a kid in a candy store to learn these valuable lessons. This book is for the true beginner in my opinion. I already knew most of the fatal flaws. I've read better books on the subject, but I will say this one was unique in that it gave writing samples and asked the reader to figure out what was wrong with them. Then they showed what their corrections would have been on the next page. One of the best "how-to-improve" your writing books I've ever read! Through practical examples and friendly teaching, five fiction editors explain how to fix those stories which have potential, and yet seem mediocre. There are check-lists for quick reference and sections to test your structure editing skills. A must-read for fiction writers. This helpful resource addresses many critical elements of fiction writing and editing. The authors distill their topics into concise, readable chapters which are wonderfully supplemented with "before" and "after" examples, showing the improvement made by eliminating each flaw. Packed with information, this is a great tool for any fiction writer. This book has a lot of good info. Still reading it. I like the examples from different writers. It's easy to follow with language that's like I'm at a writers group or listening to a writing coach. I picked up several useful tips. Some things were a bit repetitive.